Mainway has been an industry leader in conveyor design, material handling and systems integration since 1988. With dedicated service personnel and proven in-house expertise, we offer dependable preventative maintenance programs to ensure systems run reliably throughout their lifecycle with maximum uptime. 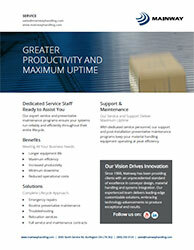 Our service and support deliver maximum uptime. Mainway’s ongoing lifecycle support and post installation preventative maintenance programs keep your material handling equipment operating at peak efficiency.